Kalev Leetaru explores new technological developments and movements in mining electronic news, while Debora Cheney offers a focused analysis of actual use of news databases. A look at two major television news archives: the Vanderbilt Television News Archive by Connie Vinita Dowell and Joseph D. Combs, and the UCLA Broadcast NewsScape Archive of International Television News by Sharon E. Farb and Todd Grappone. Megan Bernal spoke about the production and distribution of electronic news from the publishers’ perspective, while Bernie Reilly examined legal deposit considerations in the post-print era, and Mark Phillips described various academic initiatives underway aimed at preserving news content in digital form. At the end of the roundtable, Bernard Reilly examined what roles research libraries can play in long-term accessibility of the journalistic record, and outlined possible future actions. 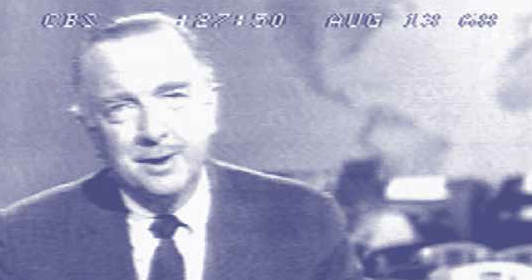 Screen shot of Walter Cronkite on CBS, courtesy of Vanderbilt Television News Archive.